Maintaining a clean, safe and healthy environment is essential to providing good care to animals, and we provide a comprehensive array of veterinary cleaning supplies specially engineered for animal facilities, including clinics and boarding establishments. Our Animal Care Sanitation Program includes powerful cleaners, deodorizers, virucides, floor cleaners and disinfectants that are necessary for a successful sanitation program. The comprehensive program addresses the three most important aspects of a comprehensive cleaning program -- Odor Control, Infection Control and General Housekeeping -- in order to make your facility cleaner and healthier for your animals, staff and visitors. What makes the Animal Care Sanitation Program different? Effective products and cleaning systems. Introduction to Multi-Clean’s veterinary sanitation program. This presentation covers products geared towards issues specifically encountered by animal care facilities. This useful resource can be used for self-education or to train large groups. 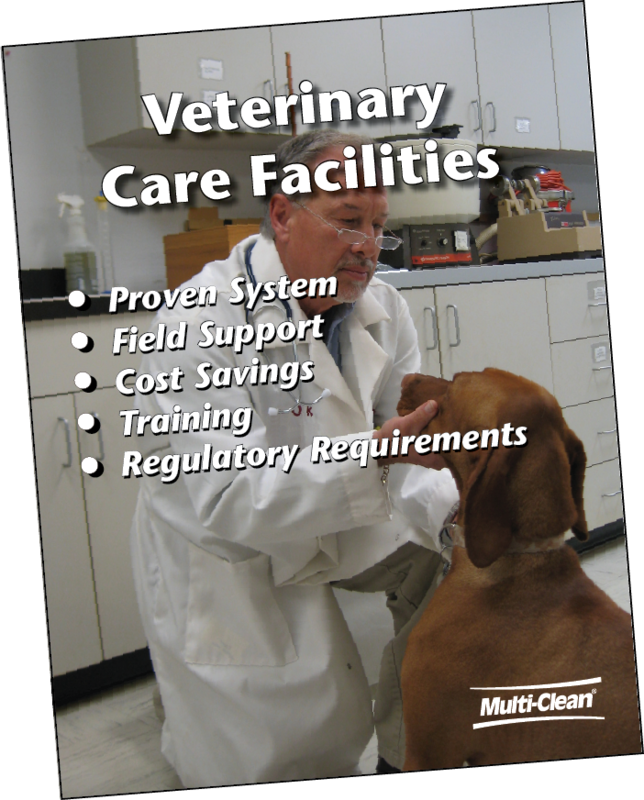 Multi-Clean’s brief, comprehensive method bulletin outlines cleaning & sanitation procedures for veterinary facilities, covering general surfaces, kennels, animal containment, and exam rooms. This method bulletin can be printed and displayed in cleaning supply areas in animal care facilities for a quick reference for cleaning professionals. This general procedure can be tailored to meet specific facilities’ needs. A ready to use product that cleans and disinfects surfaces in one step. Formulated to disinfect hard, non-porous plastic, and inanimate environmental surfaces. Classified as an intermediate level disinfectant effective on animal pathogens including Canine Parvovirus, Feline Calicivirus and Rabies Virus. Use on kennels, exam tables, and other critical surfaces. Where to Use: Use on walls, tables, chairs, exam tables, cages/kennels, feeding equipment, etc. Available in quart and 5 gallon. Multi-purpose disinfectant and restroom cleaner. Use at 2 oz/gal (1:64) for one step cleaning and disinfecting hard surfaces including sinks, faucets, door handles, and counter tops. Effective on a broad range of pathogens including Canine Parvovirus, Feline Calicivirus, and Canine Influenza. Where to Use: On any hard, non-porous surface. Available in 1 gallon. A no-rinse, neutral pH, hospital disinfectant cleaner. 256 Century Q is efficacious against Feline Leukemia and Rabies Virus. With a dilution rate of 1/2oz/gal (1:256), Century Q is formulated for daily disinfecting and cleaning of high touch environmental surfaces in veterinary facilities. Where to Use: On floors, walls, tables, chairs, exam tables, feeding equipment, etc. Available in 2 liter and one gallon. A ready to use disinfectant cleaner. Non-acidic formula cleans, kills germs, and destroys odors. Great fresh fragrance leaves restroom looking and smelling clean. Where to Use: For everyday cleaning of toilet bowls, urinals and other restroom surfaces. Bio-Power Plus is a multi-purpose biological digester/odor counteractant. It is an excellent carpet stain and odor neutralizer, breaking down and consuming urine stains and their resulting malodors. use on all types of carpet where pet stains or urine odors are a problem. Will not harm carpeting. Where to Use: Anywhere foul odors are an issue, including garbage cans, dumpsters, etc. Use as a drain maintainer to prevent drain build ups and foul odors. Also use on porous flooring surfaces including concrete and grouted tile to help removed deeply embedded odors. Available in quart, 1 gallon and 5 gallon. A concentrated, all-purpose product that both cleans and deodorizes in a single step. Leaves a lasting fresh lavender scent to make areas smell pleasant and clean. Non-dulling for all high gloss floors, and offers rinse-free performance. Where to Use: Mixed at 1 oz. per gallon, it is great in mop buckets and scrubbers for entry ways, lobbies, labs, exam rooms, hallways, and bathrooms. Magico can also be mixed for spray bottles at 1-2 oz. per gallon for general cleaning of walls, countertops, and many other non-porous, washable surfaces. Available in 2 liter and 1 gallon. Exceptional cleaning power. Penetrates and suspends soils for efficient cleaning by automatic scrubbing or damp mopping. The best cleaner for UHS programs. Does not leave a film, no extra rinse step needed. Non-alkaline formula means glossy floors will not be dulled. Safe for all surfaces not harmed by water. Certified Green Product. Available in 2 liter, 1 gallon, and 5 gallon. A ready to use, high performance cleaner for glass, mirrors, polycarbonate and highly polished surfaces. This product cuts through dirt, grime and smudges and leaves surfaces shiny and streak free. Also great for light cleaning of all surfaces including shelving, table tops, light fixtures, counters and more. An advanced foaming restroom cleaner formulated to cling to surfaces when sprayed with a foaming trigger sprayer. Use straight or dilute. Contains an organic acid salt which is non-corrosive to skin, yet is just as effective as strong acids. Foamy MAC is great for general restroom cleaning, cage wash downs and animal bathing areas. Effectively removes soap scum, water spots, mineral deposits, and lime from all acid resistant surfaces including: ceramic tiles, grout, chrome, drinking fountains, wash basins, and shower stalls. Certified Green Product. Available in quart, 2 liter, 1 gallon, and 5 gallon. Formulated to provide powerful cleaning and degreasing without compromising safety for the user or the environment, Mix at 1 oz. per gallon, has a great citrus-floral scent. Tough Green is a biodegradable product that meets or exceeds the toughest environmental performance standards. It is non-corrosive, contains no phosphorus, carcinogens, or reproductive toxins. Certified Green Product. Where to Use: Mop entry way floors, lab and exam room floors/walls, as well wash countertops, desks or table tops. Available in 1 gallon and 5 gallon. A concentrated peroxide cleaner that can be used for cleaning all "water safe" surfaces. Double-O-Seven is highly effective at removing greasy soils, soap scum, particulate soils while brightening and deodorizing at the same time. Double-O-Seven contains no phosphates, butyls, or chlorine bleach. Fresh Citrus scented. Where to Use: Diluted at 1 oz. per gallon for light/daily cleaning, or mix at 6 oz. per gallon for cleaning/degreasing of floors and heavily soiled areas. Certified Green Product. Available in 2 liter and gallons. A ready to use multi-surface peroxide cleaner for cleaning and deodorizing all surfaces. Hydrogen peroxide safely and effectively deodorizes, brightens surfaces and boosts cleaning power. Where to Use: On countertops, lunch tables, sinks, walls, garbage cans, stainless steel, plastic, rubber, vinyl, wood, and painted surfaces. X-Ray also works as a great carpet spotter! Removes beverage stains, feces, urine, vomit, blood, and other spots form carpet.